Welcome to the 2008 Joneses of Canberra Homepage. Hopefully any updates will be quicker this year! If you like what you see , or have any comments (see *Note*, below) to make then please feel free to email us, here. 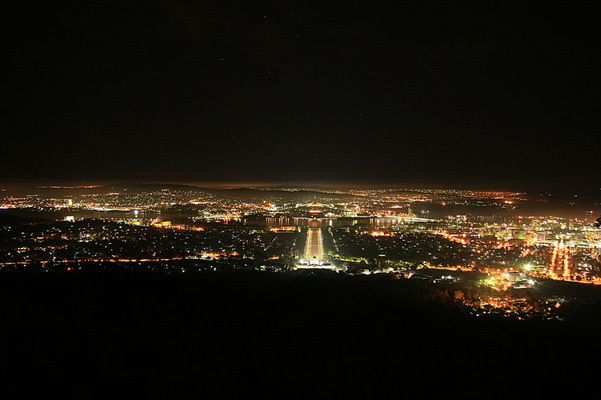 The lights of Canberra with the Southern Cross, looking south from Mt Ainslie. (*Note*) Made with the help of Ms Dreamweaver (CS3)and optimised for viewing with Mr Internet Explorer (7.0) and a screen resolution of 1680x1050, I make no apologies for any compatability problems and suggest if you have problems then contact the makers of Dreamweaver and Explorer and do your venting towards them rather than me. Alternatively, just use Explorer and purchase a widescreen LCD monitor and get on with your 21st century viewing exprience. All photos cWayneL.Jones unless otherwise stated.